Young the Giant, a rock band, performed at the Blue Hills Bank Pavilion on Thursday night. With the heavens experiencing an electric storm, indie rock band Young the Giant brought their own artful, psychedelic lightshow as a backdrop to churning rock riffs and pop beats. Having traveled north from New York, the group of five originally from Orange County lit up Boston’s harborside Blue Hills Bank Pavilion on Sept. 14 with a continuation of their tour, “Home of the Strange,” named after their newest album. Silhouetted against a flame-red rising sun, the entertainers for the evening strode onto stage and struck their starting poses. It’s only appropriate that halfway through their hopscotch across the country, the band opened with the energetic yet searching single “Amerika,” from their 2016 album. Warmed up by crowd-pleasing guest artists Cold War Kids and Joywave, few in the crowd were lounging around in the intimate space of the Pavilion; most everyone was up and soon swaying to the rhythms. 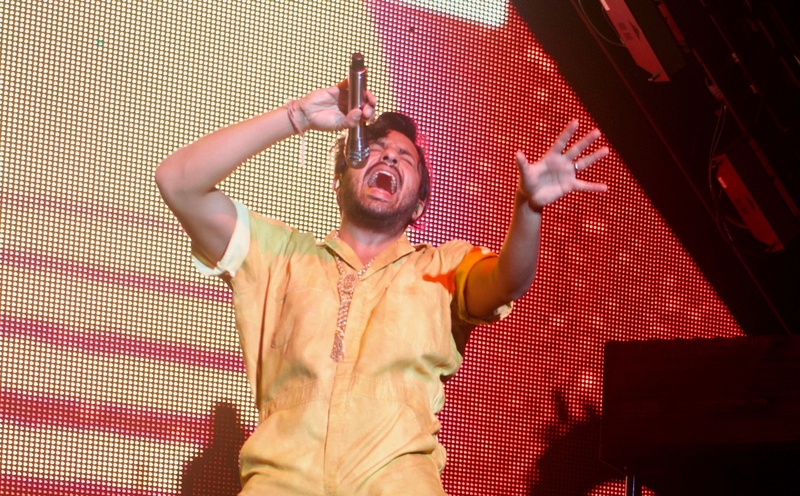 Out came the dancing frontman Sameer Gadhia, tambourine in hand, and dressed in a charismatic faded-yellow boiler suit. Whoops ricocheted off the auditorium’s walls. Between the opening numbers, they kept the audience teased with edgy guitar plucks that belie the fraught questioning and political undertones of their newest LP. The bright yellow light bathed the audience as the band swung from their fresh songs into a track from the band’s debut album, “I Got.” And Gadhia went on to show off his distinctive vocal nimbleness in shifting across different styles, from shaking out low jazzy notes to soaring to astonishingly high ethereal lilts. YTG also knew how to cut sound with suspense. In the dark, noisy guitars raged as loud as a cathedral organ; the stage lights flashed like visual sirens. Just before the bass took us careering towards a crash, the darkness broke as we dove into the narrative of “Mr. Know-It-All.” Outside of the charging verses and sparkling bridge sections, guitar riffs and the band’s signature electronic sounds whined wistfully up and down in dreamy accompaniment. With swirling orange graphics that depicted a voyage through space in the background, the band self-assuredly transitioned through a multiverse of pop and rock sounds in a single hit. Gadhia the showman made a heady dedication to all the dreamers who want to get out of their tiny town and come to a city like Boston. YTG jumped into one of their earliest tracks “Cough Syrup” for a mid-concert climax, a song kitted out with a Panic-at-the-Disco-like chorus and clap-along bridge. Doostzadeh on bass and Comtois on drums plunged deeper than they do in the studio, while the sunnier guitar riffs remained as a complementary overlay. Shuffling cosily together in the far-right corner of the stage, the members rolled swiftly into a calm interlude which the hyped-crowd try to have patience for. For the fans who enjoy the band’s “In the Open” series—alternative, chill renditions of their songs shot on tour—it was the perfect moment to feel connected to the band. One of the striking features about such a pretty famous group who have been touring for around 10 years now is their relatability and affinity with the crowd. The pared-down sounds of “Strings” unfolded perfectly, creating an intimate moment for those who were ready for it. But the radio-rock lovers did not have to wait long before the flashlights swooped up and the drums thundered in, returning us to high-tempo thrill. The resounding vibrations of the bass evoked the ominous footsteps of an approaching giant. In the stark red-and-black space, two diamond-shaped eyes stared out from the back of the stage as we tore towards the end of the set. It is left to the lead single from their second album, “Mind Over Matter,” to round off the performance with starry, synthy sounds. To close out, what could capture the mood of fatigued Boston students and workers better than the chant-a-long “My Body” with the chorus, “My body tells me no! But I won’t quit, ‘Cuz I want more…”. With friends giving each other piggy-backs, jiving loosely together in the aisles, or just going for the classic jump-up-and-down, the auditorium surged with feel-good energy. Gadhia proclaimed “His eyes are open,” and the diamond eyes on-screen flickered in response. And so the band readied itself to perform the last line of the song and “ride out of town.” The crowd headed home ready to face that Friday ahead of them, while YTG journeyed on to take showtime on to another crowd of half-believers and dreamers. The band is back, just barely, and they still have all the relentless enthusiasm of novelty. In a world of celebrity copycat beats and autotune, it often feels like artists are growing more and more detached from their work. In my 19 years of life I have attended many concerts, but none stood out to me like Born Ruffians’ did at the Sinclair on March 23. As the rain picked up, the indie-rock band Dirty Projectors overcame technical difficulties to put on a folksy show on the Delta Blue Stage.